OFFER GOOD FOR THE MONTH OF OCTOBER at $59 (plus S&H) (regularly $229). A percentage of sales benefit Bright Pink. Bright Pink is a national non-profit organization with an exclusive focus on the prevention and early detection of breast and ovarian cancer. Giuliana Rancic, host of TV’s E!, teams up with her own organization, FabFitFun, as Bright Pink’s newest partner! 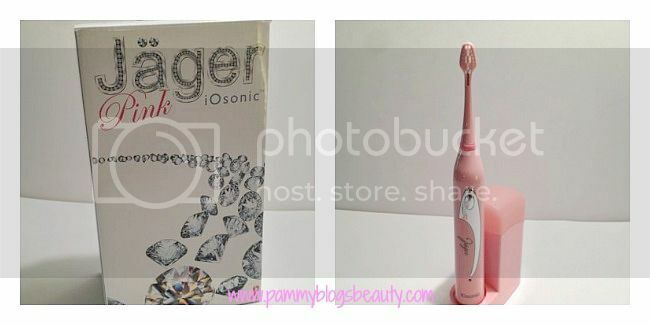 I had a chance to try out the Jager iOsonic pink toothbrush. If you are interested in hearing more about the features and my results, please keep reading! 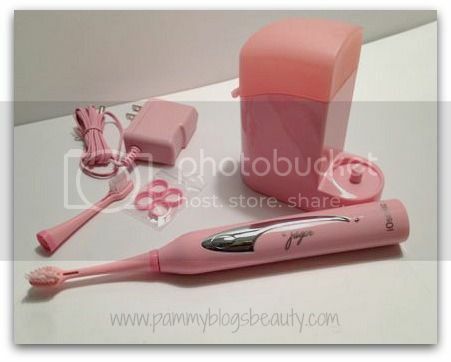 The Pink Jager toothbrush is a chargable sonic type toothbrush. The closest thing that I can compare it to is a Sonicare as that is my usual toothbrush. While I am not sure if it will totally replace my beloved Sonicare, it is another very nice option for those who like electric toothbrushes. Only extended use (over a year or so) will determine that. I find that I have trouble with my Sonicare not lasting long term (meaning: I have to repurchase every couple years). Another benefit of "going pink with the Jager Toothbrush? When you purchase it, a percentage of the sales go to support Cancer prevention through Bright Pink! I really like this toothbrush and have been very pleased with the results. The Pink Jager toothbrush uses sonic and ionic technology to deliver great results with tooth whitening and general oral hygiene. I have been testing out this Jager Pink toothbrush for a couple weeks. I am very pleased with the results! While I am a loyal Sonicare user, my current Sonicare needs to be replaced (because of charging issues). So, the Jager Pink arrived at a good time. I had been using the "old fashioned" method of just a regular toothbrush for a few weeks because of the broken Sonicare. There are a few differences between this Pink Jager toothbrush and my usual Sonicare. First of all, the brush head of the Pink Jager is much smaller and softer. At first I thought that the bristles might not get my teeth quite as clean; but, I was wrong. The soft brush works just great. Another difference is that the Pink Jager is very lightweight. Also, I love that the Pink Jager includes the germicidial UV bulb within the charging unit. While Sonicare does offer a brush that does this, my current Sonicare is not one of those brushes. I am a big germ-phobe. So, having a quick and easy way to sanitize your toothbrush is great! My only complaint? I find the brush head of the Pink Jager is a little tricky to remove to put it in the sanitizer. I have to tug at it a bit. So, I don't sanitize it after every use (probably about every 3 uses). After just a couple weeks of use, I have already noticed that my teeth appear whiter and cleaner. Not to mention, my gums seem to be in better shape. I love the sensation of the sonic vibrations on my gums. I really do think it helps! I honestly look forward to brushing my teeth with this brush! It is like a gentle massage! Plus, I will admit, the pink design is very cute. It is very retro and girly. The pink color reminds me of a 50's style bathroom with those pink tiles. Typically this toothbrush retails for $229.00. Remember, for the month of October, this brush is on special for $59.00! 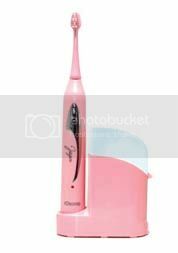 You can find this Jager Pink toothbrush at Fred Segal Beauty and at Bling Dental online. 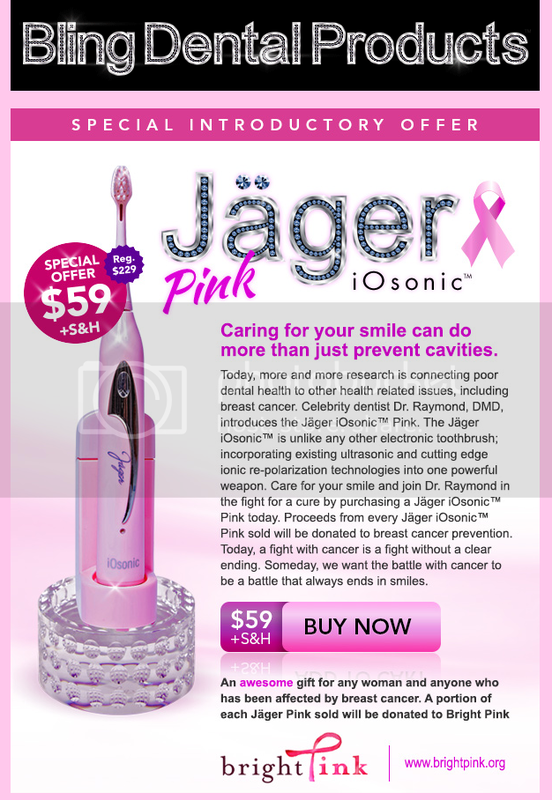 If you are looking for a new sonic toothbrush, this Pink Jager iOsonic is a great option! Its usual price is very expensive. So, if you are looking to get it, grab it in October while it is on sale.